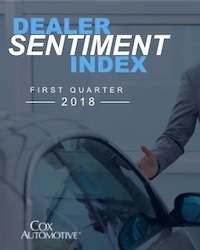 Cox Automotive Dealer Sentiment Index – First Quarter 2018 - Cox Automotive Inc. While dealers are more positive about the current market than they were in Q4 of 2017, their expectations for the next quarter (Q2 2018) are up substantially. The Current Market Index—how dealers feel about the market today—came in at 49, up 3 points from Q4 2017. The score indicates slightly more dealers feel that the current market is weak compared to the number who feel that the current market is strong. The index for the next three months was 70, indicating substantially more dealers expect conditions to be strong in the future compared to those who believe conditions will be weak. To see the highlights from the Cox Automotive Dealer Sentiment Index for first quarter 2018, download the full report below.